Knead offers Threading as a quick and inexpensive way to remove unwanted facial hair. Lip threading is only $12. Eyebrow threading is only $17. 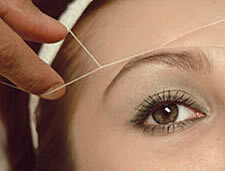 Face threading is only $28. Our beauty treatments include Facials, Nails, Waxing, Make-Up and Cream Scrub.